Version 3.0 released June 2012. See the new ArcGIS Resource Center for details. 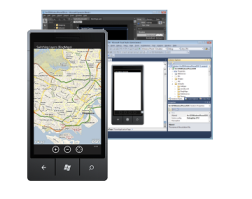 The ArcGIS API is built on the Windows Phone Application Platform which includes existing Microsoft tools and technologies such as Visual Studio, Expression Blend, Silverlight, and the XNA Framework. Developers already familiar with those technologies and their related tools will be able to create new applications for Windows Phone without a steep learning curve. Before downloading please read the System requirements and Getting started documents. When you are ready to deploy your Windows Phone application, please read the Deployment section. Use the App Hub to get the tools you need to develop and deploy applications within your enterprise or to the public via the Marketplace. Download the ArcGIS API for Windows Phone version 2.4.